And this is Steve Ember with EXPLORATIONS in VOA Special English. Today, we tell about one of the most famous national parks in the United States. You can find it high in the Sierra Nevada Mountains of the western state of California. It is one of the most beautiful places in the country. Its name is Yosemite. Yosemite National Park is a place of extremes. It has high mountains. It has valleys formed by ancient ice that cut deep into the Earth millions of years ago. Water from high in the mountains falls in many places to the green valley far below. There are thirteen beautiful waterfalls in Yosemite Valley. 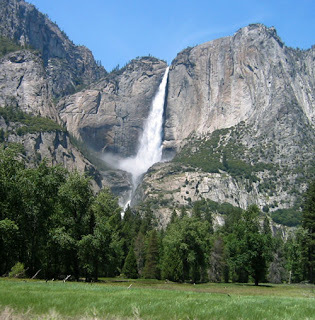 One of these waterfalls, Yosemite Falls, is the fifth highest on Earth. Up in the mountains are clear lakes, quick-moving small rivers, and huge formations of rock. 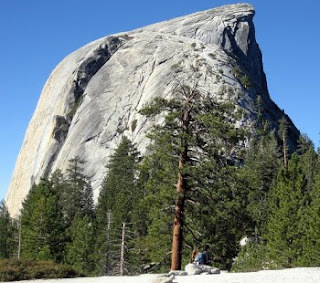 One huge rock is called Half Dome. It rises more than two thousand seven hundred meters into the air. Yosemite has a beautiful slow-moving river and large grassy areas where you can see wild animals. More than sixty kinds of animals live in the park. Deer are very common. You can see them almost everywhere. They have little fear of humans. You might even see a large black bear. You can also see two hundred different kinds of birds. Mariposa Grove in Yosemite National ParkIn a place called the Mariposa Grove, visitors can see some of the largest, tallest and oldest living things on Earth. These are the giant Sequoia Trees. One of these trees is called Grizzly Giant. It is more than one thousand eight hundred years old. One tree is almost ninety meters tall. Another is more than ten meters around. The huge old trees can make you feel very, very small. The story of the Sierra Nevada Mountains and the area that is Yosemite National Park begins about five hundred million years ago. The area then was at the bottom of an ancient sea. Scientists believe strong earthquakes forced the bottom of the sea to rise above the water. After millions of years, it was pushed up into the air to form land and mountains. At the same time, hot liquid rock from deep in the Earth pushed to the surface. This liquid rock slowly cooled. This cooling liquid formed a very hard rock known as granite. Many centuries of rain caused huge rivers to move violently through this area. Over time, these rivers cut deep into the new mountains. During the great Ice Age, millions of tons of ice cut and shaped the cooled granite to form giant rocks. Millions of years later these would become the giant rocks called Half Dome and El Capitan in Yosemite Park. Humans have lived in the area of Yosemite for more than four thousand years. The first people who lived there were hunters. Most were members of a tribe of Native Americans called the Miwok. They lived in Yosemite Valley near the river. During the extremely cold winters, these people would move to lower, warmer areas. They would return when the winter months had passed. The first white Americans may have been hunters looking for fur animals. A famous American hunter and explorer named Joseph Walker passed through the area in the eighteen thirties. He reported about the huge rock formations and said there was no way to reach the valley below. Citizens who had formed a military group were the first real modern explorers of the valley. They were at war with the local Indians and came into the valley. The white soldiers called the Indians Yosemites. The valley was named for the Indian tribe. Soon, reports of its great natural beauty were sent all the way back to Washington, D.C. 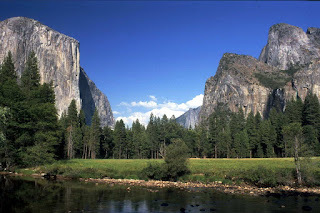 In eighteen sixty-four, a United States senator called for legislation to give the Yosemite Valley to the state of California as a public park. The legislation said the valley should be preserved and protected. President Abraham Lincoln signed the bill after Congress approved it. This event was extremely important in the history of the United States. It was the first time that a government had approved a law to preserve and protect land because of its great beauty. The land was to be kept for the public to enjoy. Yosemite became the first state park. It was the first real park in the world. In eighteen ninety, it became a national park. The National Park Service is responsible for the park today. It is preserved and protected for all people to enjoy. No major roads lead to Yosemite National Park. Visitors must leave the highways and drive their cars over smaller roads. 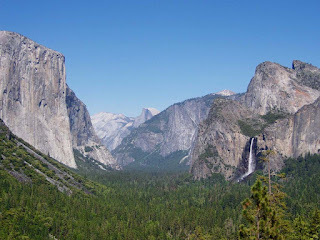 Yosemite is about three hundred twenty kilometers east of San Francisco. It is deep in the Sierra Nevada Mountains. The roads leading to the park pass over lower parts of the huge mountains. Then the road goes lower and lower into the area of the park called Yosemite Valley. Visitors can stay in different kinds of places in Yosemite Park. Several beautiful old hotels have been built on the property. Some are very costly. Others cost less. Many people bring temporary cloth homes called tents. It costs only a few dollars a day to place a tent in the approved areas. Visitors can walk through many areas in the beautiful valley and the mountains. These walking paths are called trails. The National Park Service has improved more than one thousand one hundred kilometers of trails. It is fun to explore these trails. Some take only a few minutes to walk. Others can take several days to complete. People come from all over the world to climb one of the huge rock formations at Yosemite. The most famous of these is called El Capitan. People who climb it call it "El Cap." Climbing El Cap is only for experts. This activity is called "hard rock climbing." It is extremely difficult and can be very dangerous. A climber must have expert skill and great strength. The climb is straight up the face of a rock wall. Experts say it can take about three days to climb to the top of El Cap. The climbing is very slow. Climbers must look for cracks in the rock. They place their hands and feet in the cracks and then work their way up. They also use ropes and special equipment. From the bottom of the valley to the top of El Cap is about one thousand one hundred meters. In the summer months, Yosemite Park is filled with visitors. Large buses bring people from San Francisco to spend the day. They leave San Francisco very early in the morning and arrive back late at night. They drive from one place to another to see Yosemite. Other visitors come by car. Some even come by bicycle. Some visit for just a few hours. Others take several days or weeks to enjoy the park. Many visitors come to Yosemite again and again. About four million people visit the park every year. In the winter, heavy snow falls in the Sierra Nevada Mountains and Yosemite. The snow usually begins to fall in the month of November. Heavy snow forces some of the roads into Yosemite to close during the winter months. The National Park Service works hard to keep most of the roads open. Drivers must use special care because of ice and snow on the roads. They enjoy a special beauty never seen by the summer visitors. Many winter visitors come to Yosemite to spend their time skiing at Badger Pass. Badger ski area is the oldest in California. It has a ski school for those who want to learn the exciting sport. Many visitors come to enjoy the park with its heavy coat of winter snow. In some areas the snow is many meters deep. Some of the tall mountains keep their snow until the last hot days of summer. Whenever visitors come to Yosemite, they experience great natural beauty. A visit to the park provides lasting memories of what nature has produced. Most people who come to Yosemite usually bring a camera. 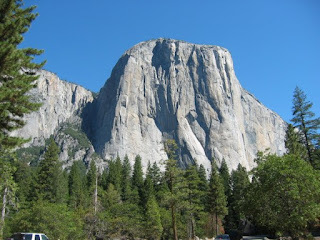 They take many of pictures of the huge rocks, the beautiful Yosemite Valley, the waterfalls and the giant trees. But you do not really need a photograph to remember its great natural beauty. Yosemite will leave its image in your memory forever. This program was written by Paul Thompson. It was produced by Mario Ritter. Our studio engineer was David Bodington. This is Steve Ember. And this is Phoebe Zimmermann. Join us again next week for another EXPLORATIONS program in VOA Special English. d. many species of bird. d. a huge sequoia tree. b. three millon years ago. d. after Abraham Lincoln died. a. live in Yosemite today. b. lived in Yosemite year round. c. left Yosemite in the winter. d. were conquered by the Yosemites. a. on the East Coast. b. on the bottom of a sea. a. "The History of Yosemite"
a. the animals that dwell in Yosemite. b. the highest trees in the world. c. a park enjoyed by millions. d. a remote jungle in California.